English Mastiffs are one of the largest breeds out there, and if you’ve got one, you’ll know they’re big eaters! They may be gentle giants, but they require a lot of calories each day to maintain their energy levels and weight. To meet their nutritional needs properly, you’ve got to give them the right food, and lucky for you, I’ve looked at a lot of options to find just the right one for you and your dog. Here I’ll be going over not only the top 10 products, but why each one might be good for your dog. On top of that, I’ll let you know exactly how to feed your mastiff when they’re young, an adult, and getting older, and what health problems you might be able to overcome just with a proper diet. Mastiffs and Bullmastiffs need lots of nutrition to keep growing as such a large breed, so I’ve got all the information on how and when to feed them to support them through their life. When it comes to buying food for your English or bull mastiff, there are a lot of options out there to choose from. I know it can be overwhelming since you want the best for your dog’s health, but I’ve got the top 10 products you’ll want to look out for. 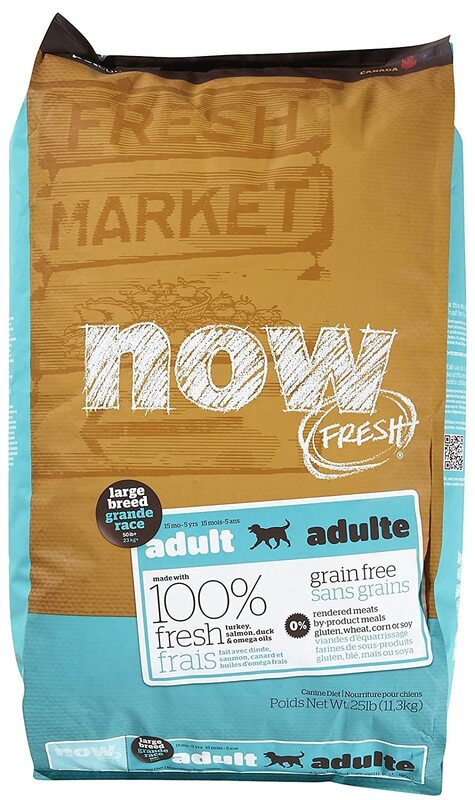 This huge bag of dog food is perfect for dogs of all ages to help with their growth and development, so you can be sure it’ll work for your english mastiff. 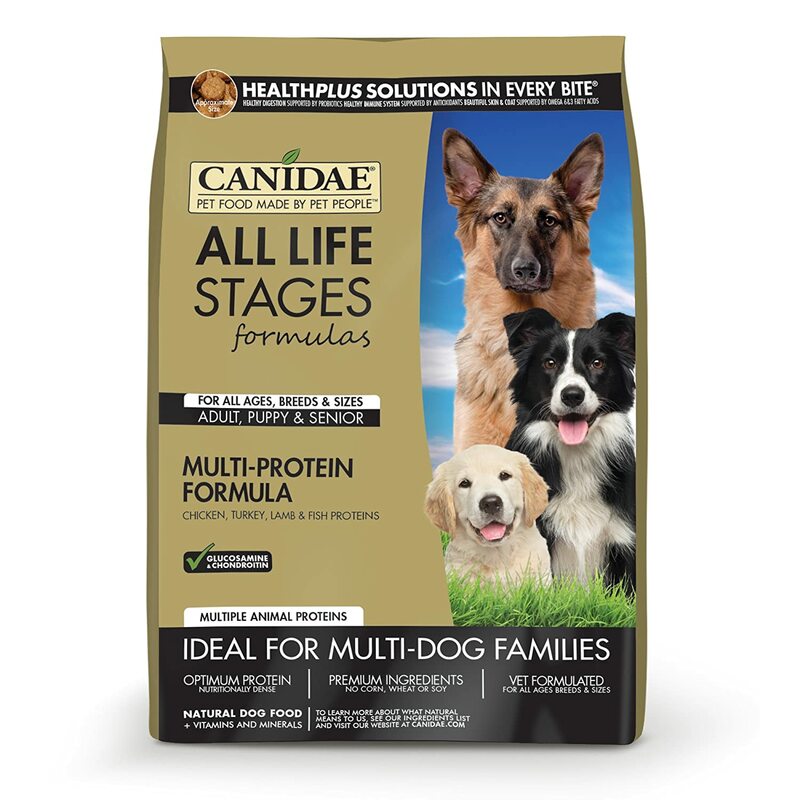 It’s formulated for all ages, breeds, and sizes, so even if you have other dogs, they can get all this nutrition too! There’s tons of protein from the chicken, turkey, lamb, and fish meals, giving your dog a nutritionally dense formula without any corn, wheat, or soy. People love that all the ingredients are both high quality and affordable too. Not only that, but most dogs love it as well! Even dogs with sensitive skin have reacted well to it and haven’t had any problems with allergies. If you’re worried about nutrition, this food is specifically designed to meet AAFCO needs, and according to buyers, gives their large dogs new energy and life. Even older dogs are feeling just like pups again after digging in. 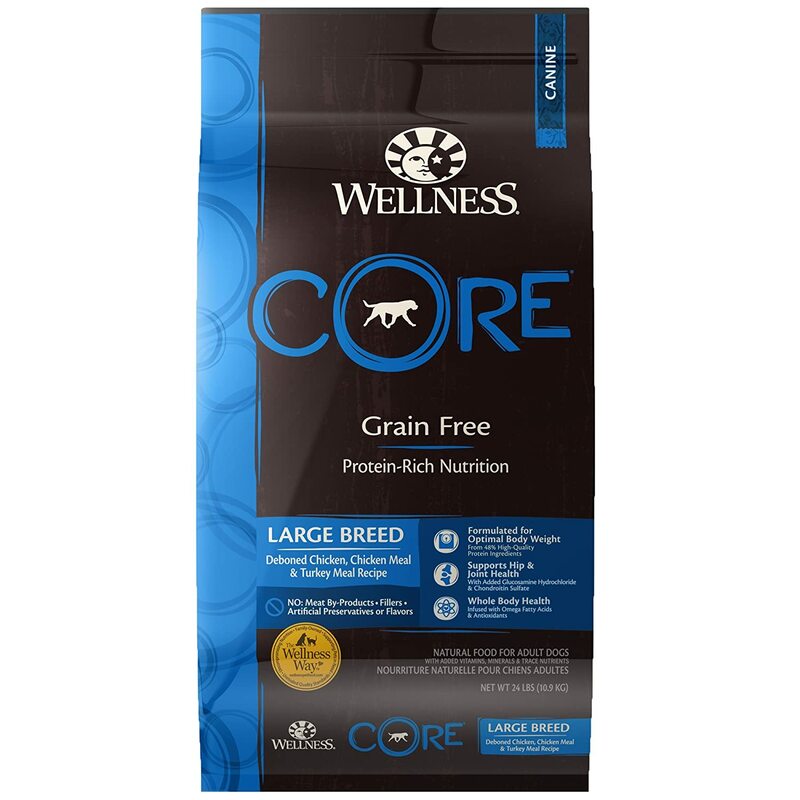 Try Now Fresh Grain Free to get lots of balanced proteins and fats meant to support an active lifestyle and a growing mastiff. Your dog will love the fresh turkey, salmon, and duck, without any rendered meats included. Omega 3 and 6 oils then work to promote skin and coat health, while antioxidants support increased immunity and healthy growth. Without any grains, gluten, beef, corn, or soy, you can be sure your dog stays in tip top shape. This food is recommended by breeders especially for dogs with some allergies. Within a short time, drippy nose, sneezing, and watery eyes have cleared up, but even if your dog doesn’t have allergies, your mastiff will love the flavor. They’ll keep coming back for more even as the fiber and protein helps them feel full and satisfied. The large kibble bits help a lot too when it comes to your dog taking a big bite! 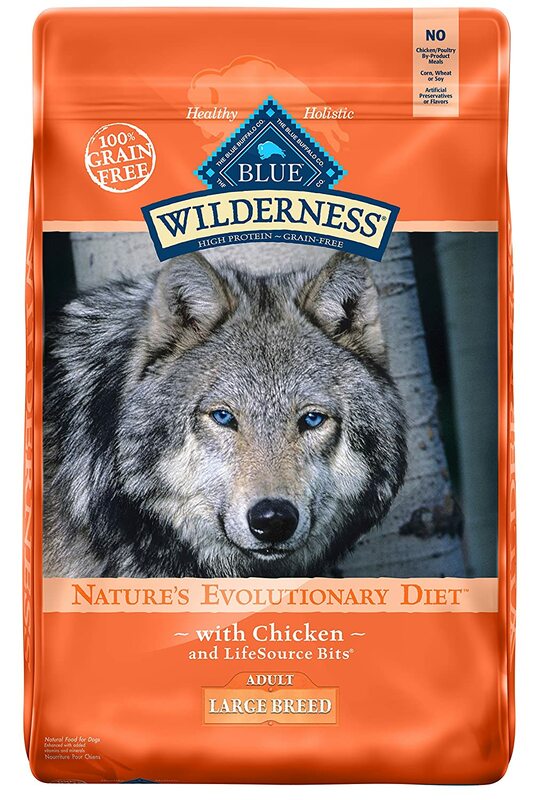 Blue Buffalo is one of the best brands out there when it comes to caring for your dog, since it contains real chicken without by product meals, corn, wheat, or soy. This means that this food is high protein and grain free, making it perfect for bullmastiffs. Blue Buffalo even includes LifeSource Bits, a precise blend of vitamins, minerals, and antioxidants meant to improve your dog’s health. The calories and carbohydrates are perfect for a growing pup. One of the best things people note about Blue Buffalo’s food is that is really helps their dog’s coat shine, and reduces the amount of times they have to poop per day. When you’ve got a big dog like an english mastiff, I can’t tell you how great this is with a busy schedule! People are also pleased with the fact that none of these ingredients are from China, and don’t include any toxins that may harm your pup. The price is even great to save you money on feeding a big dog. 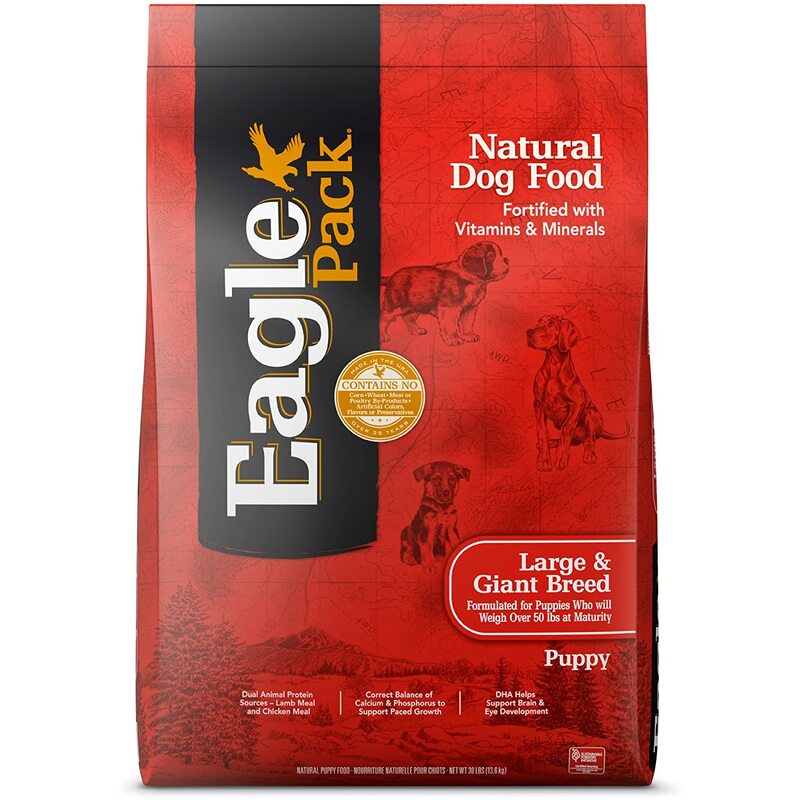 Eagle Pack includes all natural ingredients for complete and everyday nutrition for your dog. When I say it’s all natural, that means there’s no corn, wheat, by-products, artificial colors, flavors or preservatives. 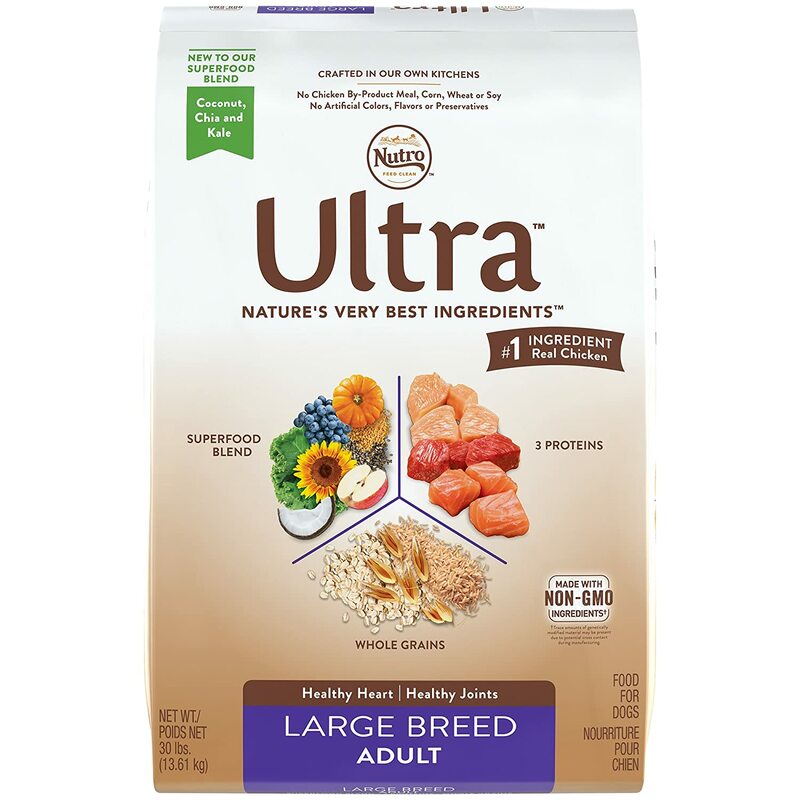 This food is even made specifically for large breeds and giant puppies, since it’s a larger kibble, and had premium ingredients like lamb, chicken, and fish. It’s even got DHA to support healthy growth in your puppy too. Above all, people are impressed with the ingredient list and the price of this food. The actual food is perfect for mastiffs since it doesn’t contribute to weight gain and instead helps build muscle with the protein that’s included. Dogs’ skin and coat look great and there aren’t even any problems with gas or bloating, like mastiffs are prone to. Best of all, this food fills dogs up and satisfies their hunger so they won’t be whining for more. Pick up this large breed food for your mastiff to help their joints, weight, and skin. The glucosamine and chondroitin improve joints as they age, and with 12 superfoods and nutrients, you can be sure your dog is getting the most they possibly can out of their food. The added coconut, chia, and kale are extra bonuses, especially since this food doesn’t have any by-product chicken meal, corn, wheat, soy, or anything artificial. Not only do people love the Nutro brand, but dogs do too. With chicken as the first listed ingredient, dogs have a much easier time going to the bathroom, and their digestive system runs much smoother. You won’t notice any gas or bloating, two problems especially in mastiffs. Coats are softer and shinier within a week, and dogs feel full until their next mealtime. With heavy eaters like mastiffs, this is definitely a must! 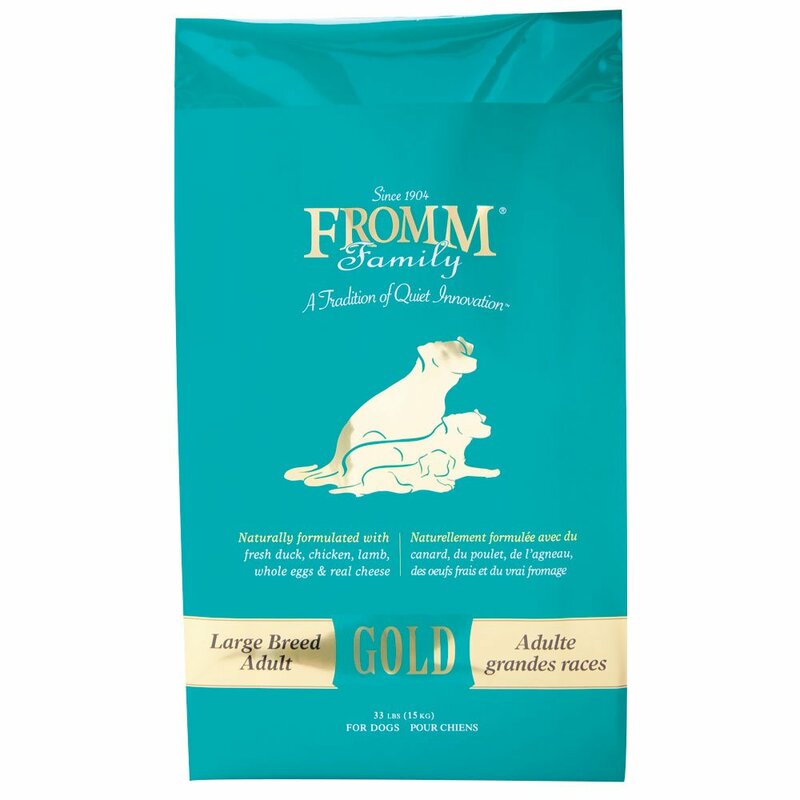 If your dog weighs over 50 pounds, as a mastiff should, Fromm makes a great food for large adult breeds. It’s meant to add some cartilage to support your dog’s joint health as they grow, with real Wisconsin cheese and probiotics to help their digestion along. Just the right amount of omega fatty acids while being corn, wheat, and by-product free keeps your dog completely healthy. The duck, chicken, lamb, fish, oatmeal, potatoes and more will have your dog coming back for more! Fromm is completely manufactured and sourced in the US and at an affordable price too! Dogs are able to eat it without acid reflux, an upset stomach, or diarrhea. Even dogs of all ages and breeds like this food, so if you’ve got more than just your mastiff, you’re completely set! Thanks to how dense food is, you don’t need to worry about portion size at all. That means weight management isn’t a problem either even for such a large dog. 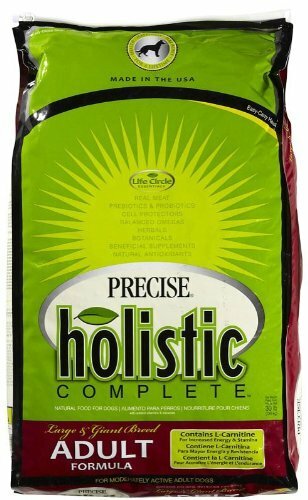 Pick up this holistic food for large and giant breed puppies to give them the extra nutrition they need to grow big and strong like they need to. Chicken and chicken meal are the first two ingredients within this dog food, so you can be sure they’re getting a completely balanced meal without any sort of by-products or artificial flavors. They’ll even get some great fiber to help their immune system along too. This food may be just a little more expensive than some of the other brands out there, but the fact that it’s got so many great ingredients makes everything worth it. The ingredients are so high quality that they smell great even when you take a sniff. After eating, you’ll find that your dog’s coat is shiny, their energy is great, and they shouldn’t be gaining any weight either. If your mastiff has some allergies too, this food will fix them right up. Wellness CORE is another one of those brands that you hear a lot about, and for good reason. The large breed formula is protein focused, including no grains but with higher levels of ingredients like chicken, turkey, glucosamine, and chondroitin to meet the needs of your bullmastiff. There are absolutely no artificial flavors, colors, or preservatives, and forget about wheat, corn, soy, or meat by-products too! All of these natural ingredients are sure to help your dog grow just as they should. When it comes to strengthening up the joints, this food works great! Mastiffs are known to have joint problems, which is why Wellness CORE is a great option for your pup. It works great when it comes to digestion too, relieving constipation quickly without giving your dog more digestive problems along the way. Softer coats and better skin should be noticeable quickly, and at this price, it’s almost impossible to beat. 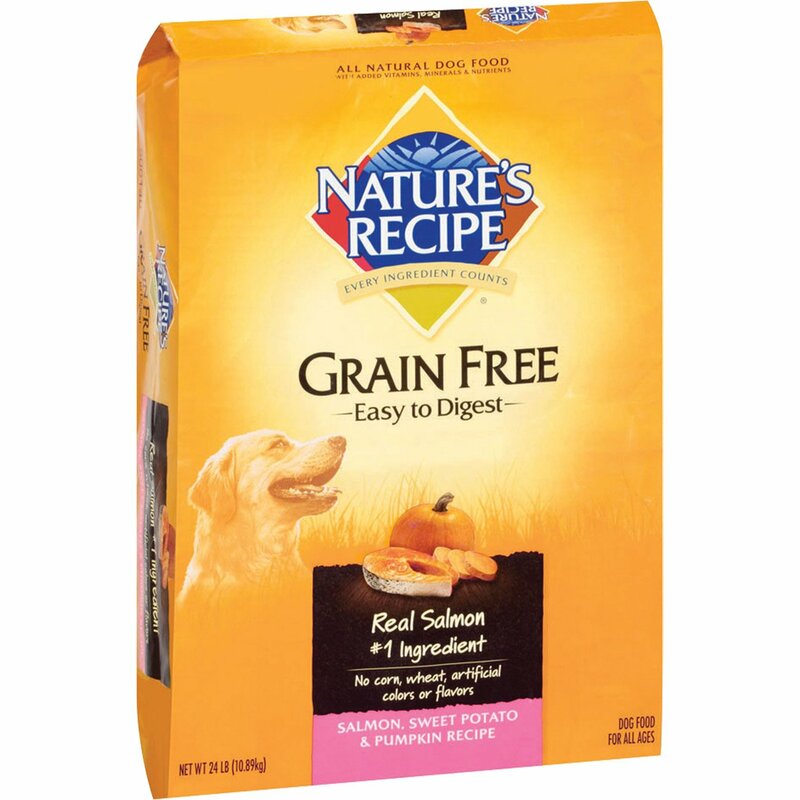 This dry dog food by Nature’s Recipe has real salmon as the first ingredient, with high-quality protein meant to support and maintain proper muscle health. The sweet potatoes and pumpkin are not only grain free, but work wonderfully as carbohydrates to help with energy and growth. Especially if your dog has an allergy, this is great, since there’re no beef, corn, or wheat. Whether you’re feeding it to a puppy or a senior dog, Nature’s Recipe is meant to keep your dog in top shape. This food works great when it comes to giving your mastiff a clean and shiny coat, along with proper digestion in case they’re having any stomach issues. Dogs love the flavor as well, and if you have multiple dogs, you can feed all of them just this one brand. Not only does it taste good though, but it helps your dogs poop right and assists with allergies too. Many owners say this is the only food their dog can eat without throwing it up. Finally we have Whole Earth Farms, coming at an affordable price for all the completely nutritious ingredients that you’ll see. There are multiple protein sources that provide the best the earth has to offer, like pork meal, beef, lamb, and even foods like dried blueberries. Don’t worry about allergies either, since there’s no corn, wheat, or poultry by-products included. All ingredients are sources right in the USA, so you can be sure they’re fresh. 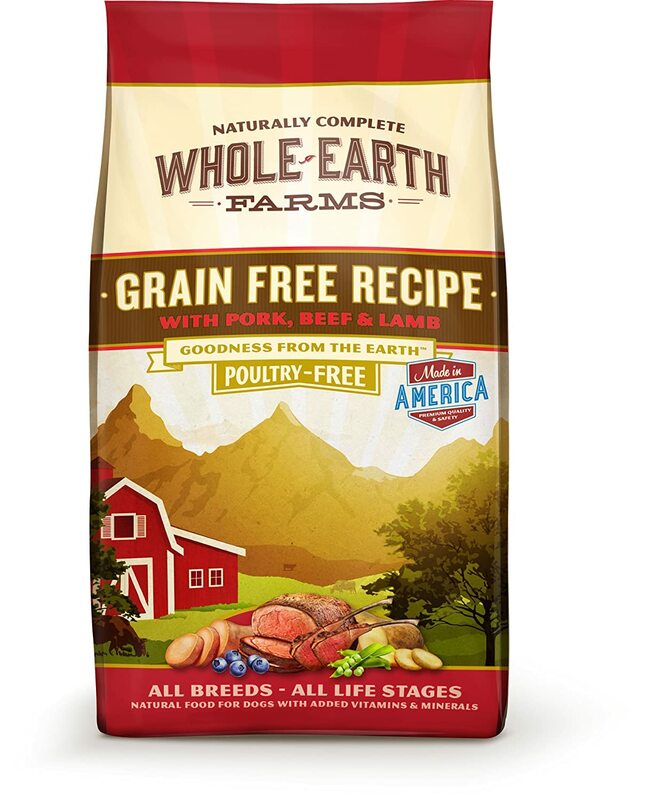 Even dogs with serious skin allergies benefit from Whole Earth Farms food. Within a week, people notice a huge difference in their dog’s coats as even picky dogs chow down. The kibbles are only about as big as a dime, making them perfect for larger dogs to chew with ease. Dogs love the kibble, but people love how affordable this food is while still being natural and perfectly good for your pup. I’ve given you a look at the products that you should be thinking about when it comes to your English Mastiff, but with so many great options, how do you choose just one? Before you buy, keep these considerations in mind. Before we think about food, let’s think about the mastiff breed in general. These dogs are great guard dogs and perfect for protection, but they’re also very lovable and gentle. They’re about 30 inches tall, but can be as big as 36 inches. On top of that, they can weight anywhere between 160-230 pounds normally. For the most part, mastiffs are laid back and don’t use a lot of energy playing around, but they do consume a lot due to their size. If they’re still growing, they’ll need even more to eat, and lots or protein to keep them going. Just an average mastiff weighing 200 pounds needs as much as 3710 calories! Obviously a high quality diet is important regardless of what breed of dog you have, so in general, all dogs need three specific nutrients: protein, fat, and carbohydrates. Dogs generally can’t process plants very well, so be sure anything you feed them is highly digestible. Actually, your dog’s food shouldn’t have more than 5% of crude fiber, or they’ll experience some digestive problems. Protein is the most important, and should be at the very top of the nutritional pyramid. Minimally, make sure they’re getting 18% protein, but Mastiffs may need a little more thanks to their size. This protein allows your dog to maintain its muscle mass, although keep an eye out for the fats. Too many fats for a mastiff will increase their weight and possibly lead to obesity if there’s too much. In terms of carbohydrates, make sure it’s all digestible. Whole grains as usually okay, but if your dog has an allergy, those are off the table. Try grain free options with sweet potatoes, peas, or other starchy vegetables. All these carbohydrates will provide dietary fiber to support digestion. Look for other nutritional supplements in your dog’s food as well. Two or three meat proteins should be in the first several ingredients listed. Whole meats and meat meals are great for protein, so look for chicken, beef, fish, and lamb. Meals are perfect because they have much more protein than whole meat, and are used in many of the brands above. In terms of fat, look for chicken fat or fish oil that can provide omega-3 fatty acids. This will keep the skin and coat healthy. Puppies can also benefit from DHA, a fatty acid that help with brain and eye development. Older dogs do well on medium chain triglycerides with medium chain fatty acids, helping them feel and act younger. They’re made from both coconut oil and other oils. If your dog cannot have corn, soy, or what, they might still be able to eat rice, barley, oats, or some other grain or cereal. You can also look for carbohydrates like sweet potatoes. Remember that your mastiff doesn’t need an excessive amount of protein, but be sure to keep the amount of carbohydrates low to moderate. The Mastiff is such a giant breed, so you’ve got to be sure that your dog gets enough food to support their weight. Just puppy mastiffs eat 4 cups a food a day, and as many as 12 when they’re an adult! Space your mastiff’s meals evenly throughout the day while being sure to be careful not to feed them too much. Too much food will cause them to grow too quickly, putting strain on their bones and joints and increasing the risk of musculoskeletal issues as an adult. It’s important not to feed your mastiff too much when they’re a puppy. Even though the mastiff is a big breed, they need to grow slowly. If puppies have too much food and gain weight too quickly, they can have muscular and skeletal problems later in life with all the extra weight they can’t yet support. By the time your dog is around seven, they’ll start to show signs of aging since many of them live into their teens. As they do get older though, they’ll become less active and may start gaining some weight. Because of this, go for a food that’s made just for seniors. This type of food will have fewer calories and less protein since your dog doesn’t need as much energy. In most cases though, you can just cut back on portions and try to increase their exercise. It can be hard trying not to feed your dog too much or too little. That’s why it’s actually easier to think in terms of calories rather than cups of food. That’s because food formulas are made differently, so one cup isn’t always the same amount of calories. While most adult dogs need 30 calories per pound, large breeds like the mastiff need around 20 per pound. That can mean around 2400 calories a day when they’re younger! Think about your dog’s weight when you feed them first then so you don’t give them too much or too little. Be sure to pay attention to the protein and fat ratios too. As I said before, look for 18% protein and 5% fat to give your dog the most amount of energy without them going overboard. Try a formula that’s supplemented with some glucosamine and chondroitin for bone and joint support. These will help with digestion too so your pup can absorb all the nutrients they eat. When it comes to mastiffs, there are a number of problems they can experience. Sometimes giving them the right food can help, although other times they’ll need some more serious care. For instance, mastiffs are prone to some eye problems and joint problems like hip and elbow dysplasia. Then there are other problems like cancer, epilepsy, bloat, heart disease, hypothyroidism, von Willebrand’s Disease, and Wobbler’s Syndrome. Thankfully though, some of these can be affected just by changing up your dog’s diet. You can’t completely prevent all health issues, but there are a few things you can do to help your dog’s health along. Food that’s free of common irritants like corn, soy, and wheat works perfectly, although you might want to think about food free from beef, dairy products, and chicken too if your dog has some digestive issues. On top of that, be sure to stay away from artificial colors, sweeteners, and preservatives. All of this will help your dog’s immune system stay strong as they grow. While mastiffs are usually mellower, if you’ve got one that likes to play and run around a little more, they may need slightly more calories in their diet. It really depends on their individual metabolism, their age, and if they’re spayed or neutered. Believe it or not, those dogs that are fixed or older need slightly fewer calories than normal. Also, don’t leave your pup’s food out for more than half an hour. Half an hour is more than enough time for your dog to eat, but if you leave it out all day your dog is much more likely to gain weight. Two meals a day should be fine like most dogs. There’s a lot to consider when it comes to your dog’s health, especially when it comes to feeding a dog as big as a mastiff. Don’t worry though, since I’ve found the Best Dog Food For English Mastiffs that’ll work perfectly for your poocj, giving them a healthy weight and allowing them to grow properly. I found a lot on how to feed your dog too as they grow up, but if you still have any questions, or have a few comments, be sure to leave them down below! The Best Toys For Dachshunds Rated and Reviewed. Play On!